* Free FAST Wireless Internet* **Free Beach Service during Season** AND free long distance to anywhere in US or Canada! The Mediterrania is an exciting, upscale luxury condominium resort located on the beach with breathtaking views of the emerald-green waters of the Gulf of Mexico. The Mediterrania is indeed 'special' and features lovely manicured gardens, a huge pool, fountain spa, a community clubhouse, fitness center, tennis court, underground parking, and a gazebo which leads to the beach. Our unit is a non-smoking unit, sleeps eight, is rated 'PLATINUM' , and is decorated in a gorgeous, casual elegance, beautifully designed by Norwalk Furniture. The unit comes with crown molding throughout, tile floor (except bedrooms), designer window treatments, beautiful bedding , shower curtains and pillows, and gorgeous art work. The large living area is centered around an elegant but comfortable sectional, with beautiful accent pieces of furniture. The master bedroom is very classy with a spacious master bath that includes a jetted tub, separate shower, dual sinks, and a built-in makeup dresser. The second large bedroom has two full-size beds and also comes with its own bathroom. The sectional will convert to a queen-size bed, and there is a half bath for your guests. The unit comes complete with everything you need including three TVs, three DVDs, free high speed wireless internet access, washer and dryer, and a fully-equipped kitchen with microwave. You can dine or relax on the patio and enjoy the view or watch your children in the giant-size pool, which is located right in front of the unit, or you can walk through the Mediterrania Gazebo to the emerald-green waters of the Gulf. We are now offering free beach service (two chairs and one umbrella) from early March until Oct 31. The Mediterrania is very special and is designed with luxury in mind. It is close to wonderful restaurants, shopping, near Pompano Joes, and just minutes from the outlet mall and Destin Commons. I hope you will choose to visit our vacation home soon. We were very impressed with the style of the Mediterrania and the location...that its right in the middle of everything. I love the beach and pool. Our condo has wi fi. We enjoy the workout room.....and most important, we just love to walk across the street to Pompano Joe's! Unlimited long distance to anywhere in the US or Canada! Walk off the balcony to the pool or beach! Heated pool over spring break! 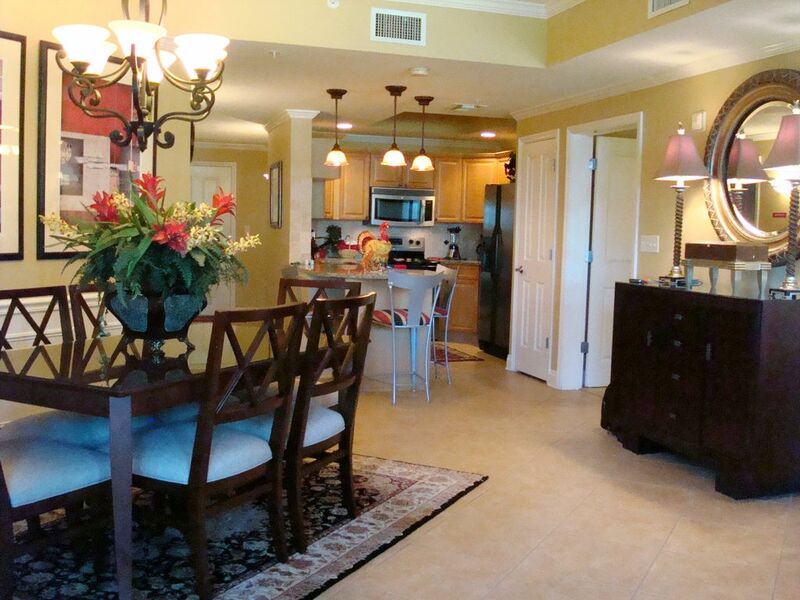 This is our favorite complex in Destin. Condo was beautiful, pool is pristine - we had a lovely week. Cati, thanks so much for the great review! I am so glad you had a wonderful time, and we look forward to your next trip to the Mediterranea! B206 is a lovely and comfortable condo. All the comforts of home. Parking was simple, and loading/unloading was a breeze. No stairs!! The gated grounds add a feeling of security. It's a roomy unit, and well stocked. Since its on the ground floor, the pool is literally just outside the patio door. Loved the location, as well. If you are looking for a unit that is close to the beach, however, you may be disappointed. It isn't an easy trek, as there are gates, codes, a walk across the street, stairs, and a bit of deep sand to cross before reaching your free chairs and umbrella. It's a private beach, right next to Pompano Joes. We felt comfortable just leaving our stuff on our chairs all day, while coming and going. The pool is sparkling clean, the landscaping is lovely. The view from the condo is nice, and the patio is great. You can see the ocean from the windows, and there is very little traffic on the road in front. If peace and relaxation is what you're looking for, I highly recommend Mediterrainea! Donna, the owner, is fabulous as well! Beautiful condo with easy beach access! We had the best time this vacation! The condo is clean and beautiful! It’s a first floor condo which makes it super easy to access. The pool is about 15 steps off of the back patio, and keep walking about 2 more minutes and you’re at the beach. The owner is really nice and even offered to let us stay an extra day complimentary since it was a holiday. Unfortunately work required us to return to Texas. We have been to Destin many times and this condo was by far the best. The beds are comfortable and the decor is nice. Kristie, thank you so much for the beautiful review! It made my day! We had a great time in paradise. Love the condo. Great location and view. We look forward to our next vacation here. The condo was very big, comfortable and beautifully decorated. Susan, thanks so much for the great review! We are so glad you had a wonderful vacation! Everything was exactly as pictured. Lovely property. Gated access. Beautiful pool and hot tub. Directly across from the beach. Beach chairs and umbrella provided. Great location, near great restaurants and shopping. Great experience overall! Our condo was clean, comfortable, well stocked, and beautifully decorated. We have already booked it for next October! From $950-$2300/wk $1975/Mo avail Nov - Feb. We do not rent to anyone under 25 years of age! Absolutely no Smoking and no pets. Cancellation Protection can be purchased through: CSA Travel Protection at 800 349 8218 or on the VRBO or Homeaway website! We typically rent sat to sat for a minimum of 7 nights. If we rent less than 7 nights, then there cannot be just one or two nights open between guests.